A little bit of sour, a little bit of sweet, a little bit of strong and finally some weak..and no, its not a Planter`s Punch i`m making – its a Canal Street Daisy! 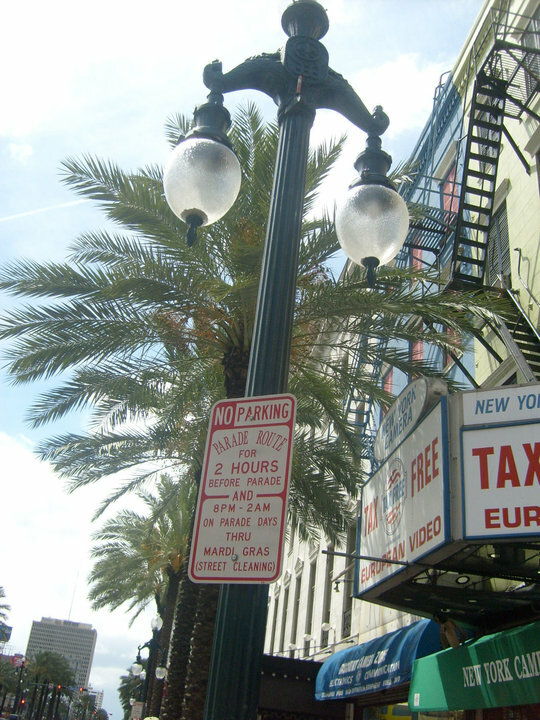 It takes its name from the famous Canal street which was made in the colonial era and divided the downriver older French/Spanish quarter and the newer upper American part of the city.The street was built where New Orleans was supposed to get a canal to be the dividing line.The canal was never made and so instead the Canal street street was constructed. The wide median earmarked for the canal was referred to by early inhabitants as the “neutral ground”, due to the animosities amongst culturally distant residents on separate sides of the avenue. The term is still used in NO to refer to all street medians. It´s a wide street and here`s where they meet – New Orleans historical streetcars. I like Canal street and since i`ve never yet had any Canal Street Daisy i wanted to try it out and see if i liked it too. I found the drink in my book “Famous New Orleans Cocktails and how to mix`em” by Stanley Clisby Arthur. It was first written in 1937. This drink does in older recipes contain orange juice but in this book it doesn´t – instead grenadine is used and this is the version i`m making so now i get a chance to try my new hibiscus grenadine as well. A beautiful street to give name to a beautiful drink – much due to the bright red grenadine. A Daisy is basically a sour (citrus, sweetener and spirit). with some soda added and it should be very cold. Garnished with seasonal fruits and mint. 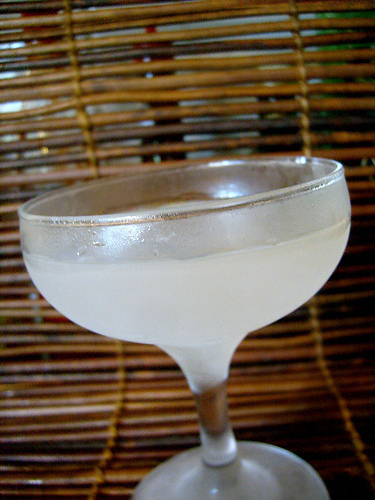 A number of base spirits may be used and then shaved or cracked or crushed ice. And then finally it should be served in either a cocktail glass, pewter mug, Julep cup, large goblet or highball. Garnish with seasonal fruits and mint. Swizzle in a julep cup or highball until frosty, then top with soda and garnish. Its a very refreshing cocktail and should be served ice cold! i like the homemade hibiscus grenadine in it, it adds an extra tropical tang to the drink that is very refreshing. And homegrown fresh mint as garnish is not wrong either..
We must go back to the 1793 when Antoine Amedèe Peychaud, a creole of a french family who was an apothecary went to New Orleans, Louisiana while his sister went to Paris during the insurrection of Saint-Domingue. He brought with him to New Orleans his family recipe which was a secret formula for a tonic called bitters. He opened a pharmacy shop with his sister – who he had brought over from Paris – on 437 Royal Street where today there`s an antique shop. He used to serve friends and other folks who needed “a little something” for their stomachs – some brandy made better with his bitters and of course his bitters, like other bitters – were used to cure all kinds of illnesses. He served his bitters spiked brandy, some water and sugar and according to the legend served it in a double-end egg cup called coquetier (ko-k-ta`y) which probably was the fore runner of the jigger – and as the legend has it – the name is the fore runner to the word “cocktail” But really – the word “cocktail” is actually much older than that but opinions vary. Peychauds bitters naturally leads us to the Sazerac. This is one of the cocktails that i love the most. Born on Royal st in a bar that no longer is there – but in the sidewalk still remains lettered the word “SAZERAC” – this is where the entrance to the bar was. Originally it was made with a cognac brand called “Sazerac-Forge-et Fils” from Limoges, France. This cognac and peychauds drink was drunk at the Sazerac Coffee House but the cognac was substituted with rye sometimes around 1870 because cognac was harder to find. At the same time when Thomas Handy took over the Sazerac Coffee House it became the Sazerac House. 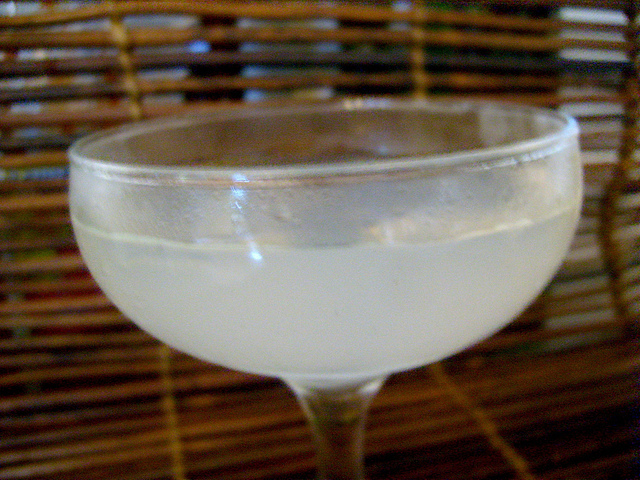 This is also when the absinthe started to be used in this drink – until it was as you know – banned and replaced by herbsaint which now has come back in its original state. In 1949 the bar moved to Roosevelt Hotel ( former Grunewald Hotel ) which in 1965 became the Fairmont Hotel – badly damaged and closed after Katrina and the federal flood in 2005 – but eventually it was purchased to become a Waldorf Astoria hotel and got back its former name Roosevelt ( which was a name in honor of President Theodore Roosevelt) And in 2009 the Roosevelt New Orleans officially opened and there the Sazerac bar and restaurant is today. Did you know that in prior to World War II the Sazerac bar only admitted men? Ladies were not allowed to drink at the bar – only on Mardi Gras Day. Luckily that changed in 1949 when the bar relocated to the Roosevelt Hotel and on opening day for both genders the women outnumbered the men. The combination of rye (or why not equal parts rye and cognac) peychauds and absinthe or herbsaint is amazing and addictive – and it grows on you. The balance of flavors is just perfect. Let´s have one, let`s have two.. Discard the ice from the first glass and add herbsaint or absinthe and coat the sides of the glass, then discard the excess (i like to leave a drop or two in the glass) Strain the rye into the glass and twist a lemon peel over the glass to express the oils, then rim the glass with it as well. Discard the peel, or if you like use it as garnish – but don`t drop the entire peel back in the glass. If you are interested in the history and folklore attached to the great New Orleans hotels that have gone by the names Grunewald, Roosevelt, Fairmont – and once again, the Roosevelt – then this is the seminar for you. From the Cave and Blue Room to the Sazerac Bar – this seminar will take you on a trip that breathes history starting somewhere in the 1893s up to present day. There will also be a focus on the drinks – from the Sazerac, the Ramos Gin Fizz, and many other great cocktails like the Bayou Swizzle – to authentic artifacts, menus, authentic glasseware, advertisements, matchbooks, etc which will be displayed. Here´s your chance to learn about the colorful history of these historic venues and their cocktails and much more. The session is moderated by Philip Greene and panelist is Chris McMillan – so you`re really in for a treat. Seriously – don`t miss this! Philip Greene is an attorney, writer and cocktail historian. As one of the founders of the Museum of the American Cocktail (based in New Orleans), he serves as treasurer and legal counsel, and is on the Board of Directors. Phil is an attorney in Washington, DC, serving as Trademark and Internet Counsel to the U.S. Marine Corps at the Pentagon. Having deep ancestral roots in New Orleans, Philip is well versed in its history and rich cocktail and culinary traditions. 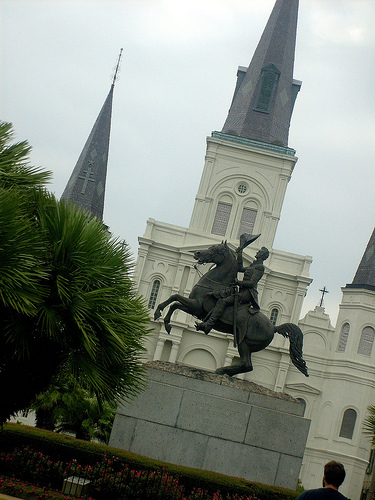 His Orleanian ancestors include Antoine Amedee Peychaud, the creator of Peychaud’s Bitters and the original Sazerac cocktail. Chris McMillian Descends from four generations of bartenders and is native to Louisiana. Chris is now partnering with acclaimed chefs Allison Vines-Rushing and her husband Slade Rushing at the Renaissance Pere Marquette Hotel where McMillian entertains his guests with outstanding classic drinks and often treats them to a lesson in cocktail history as well. 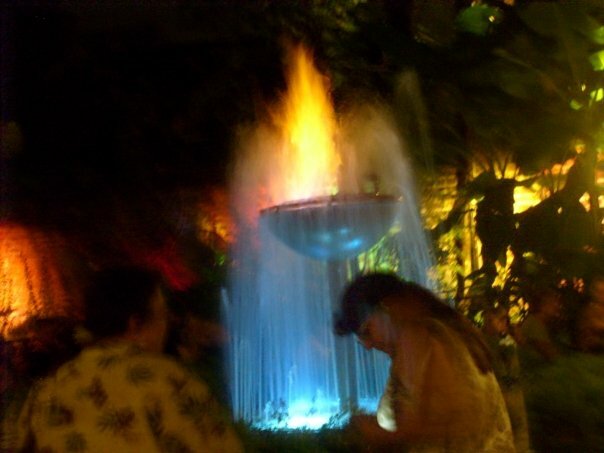 Much of his work has been used to tell the story of the American Cocktail and its place in history. When he is not conducting mixology seminars in New Orleans for guests and locals, he can be found at national and international events as a guest speaker. He is also one of the original founders of the Museum of the American Cocktail. Check out all the details and get your tickets on the Tales of the Cocktail`s website.